Serious bicycle riders know the importance of good bike maintenance. A regular schedule of maintenance is important to keep your bike in good condition (Source). Very basic maintenance doesn’t require much equipment, but for more involved maintenance, a bike repair stand becomes a necessity (Source). Performing these repairs yourself saves money in the long run by reducing trips to the mechanic (Source). Bicycle repair stands elevate your bike off the ground, allowing you to make repairs easily at home. They are almost always height-adjustable so you can work from a standing or seated position. Usually, a single clamp supports all of the bicycle’s weight. This clamp can rotate 360˚ and must be locked into place with a locking mechanism. Bike expert Jon Stynes recommends that you raise the bicycle seat and clamp it by the seatpost whenever possible (Source). Stynes explains that the clamping mechanisms on these bike stands can be over-tightened, which runs the risk of crushing the frame of the bike. Which option is best for you will depend on how much space you have available. When choosing a bike repair stand, be mindful of the weight limit – our top 5 picks have weight limits ranging from 50 pounds to 65 pounds. This mechanic bike repair stand offered by Bikehand is well-balanced, compact and versatile. Users love that the rack is adjustable, but some do note that there are too many plastic parts. The Bikehand repair rack stand has a full alloy aluminum body, a quick release, a foldable tool place, and a weight of 4.88 kg. Another great thing about this product is that the 360-degree rotating clamp allows you to clamp on the seatpost or the top tube. Keep in mind that this stand is suitable for bikes up to 25 kg, and it has one year warranty. A reviewer comments that the Bikehand bike repair rack sets up quickly and that it doesn’t take much space when folded. He adds that the bike stand is stable and that it’s far more durable than he expected. Another user observes that the rack doesn’t require any assembly and it rotates smoothly. He highly recommends it to anyone looking for a solid bicycle work stand. A purchaser also notes that the repair rack exceeded his expectation and that it’s very easy to work on his bike. However, some customers have said that the collar and the clamps don’t tighten as they should and that they are cheaply made. Some users also note that the bike stand is too wobbly and that it’s too light. If you are looking for an affordable bicycle repair rack, you might consider this bike work stand offered by RAD Cycle Products. Users love the tool tray with a magnetic strip, but some do note that the rack is not very durable. 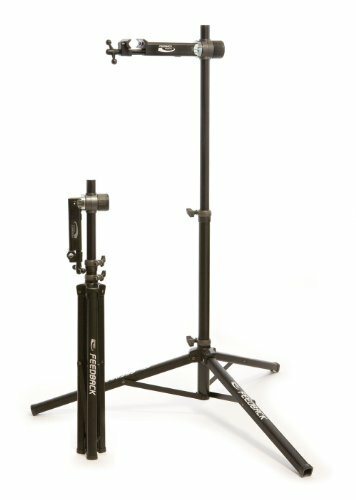 The RAD pro bicycle work stand features an adjustable telescoping pole (41” to 75”), 360-degree rotating clamps, an adjustable handlebar rod to stabilize the front wheel, and a maximum capacity of 30 kg. Another great thing about this product is that the legs fold, which makes it easy to store. The package also contains a hex key. A purchaser observes that the RAD bicycle repair stand holds the weight of his 55 lb bike for days with no issues and that it takes two minutes to set the rack up. He highly recommends it as the best cheap bike rack- great for installing adult training wheels. Another user comments that he has been using the adjustable bike stand for months and that he is very pleased with its design and durability. A buyer also notes that the bike stand makes maintenance easy and that it’s holding better than he expected. However, some customers have said that the clamp connectors that are supposed to lock the stand are plastic and it’s impossible to tighten them properly. As a result, the bike rotates freely. They don’t recommend it for heavy bicycles. This portable bike repair rack offered by Conquer is compact, easy to set up and an excellent choice for anyone with limited space. Users love the design and the stable base, but some do note that they received a product that doesn’t match the provided picture. This compact home bicycle stand measures 8” x 6” x 43”, and it features folding legs for easy transportation, adjustable height from 45” to 72”, a 360-degree rotating head, and an adjustable clamp. Another great thing about this stand is that it comes with a tool tray to keep your bicycle repair tools close. A reviewer comments that he was skeptical at first regarding the quality of the portable bike work rack, but it didn’t have any issues holding his BMX in a comfortable position. He adds that he highly recommends it for home mechanics, but notes that it’s not suitable for professionals. Another buyer observes that the bike stand has a solid construction and that the height of the pole is easy to adjust. 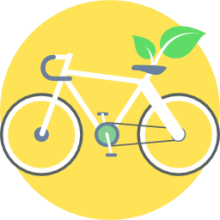 A user also notes that the portable bicycle rack has a metal frame and that it doesn’t take much space when folded. However, some customers have said that there are no proper instructions for use and that the joints are plastic and not very durable. Some also point out that the clamp doesn’t hold the bike steady. If you are searching for a top-rated bicycle repair rack for your home, then your might take a look at this bike work stand offered by Cycling Deal. Users love the included magnetic tool plate, but some do note that the rack is made in Taiwan. 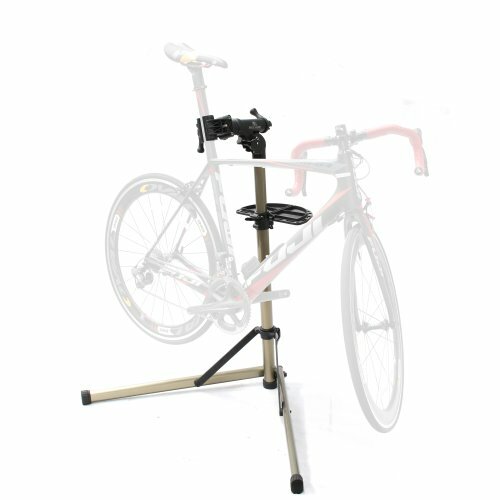 The Cycling Deal mechanic bike stand features full alloy aluminum construction, a quick release option, adjustable height up to 59” when fully extended, and a weight of 5 kg. Another great thing about this product is that it ha a 360-degree rotating head and one year limited warranty. The recommended bike weight is up to 25 kg. A buyer comments that the bicycle repair rack folds very quickly and that it’s light enough to transport it wherever you want. He adds that the rack is stable and that there is no assembly required. A user also states that the bicycle stand rotates smoothly and that it clamps tightly on the seatpost. Another user shares that he has been using the bike repair stand for almost three months and he can’t imagine doing bicycle maintenance without it. However, some customers have said that the clamp is very poorly designed and that it’s not strong enough to keep the bike steady. Some also note that the rack wobbles and that the quick release is problematic. This mechanic bike repair rack offered by Feedback Sports is well-balanced, foldable, and a product of high-quality. Users love that the tripod configuration holds the bike steady even on uneven surfaces, but some do note that it’s not very suitable for heavy bikes. 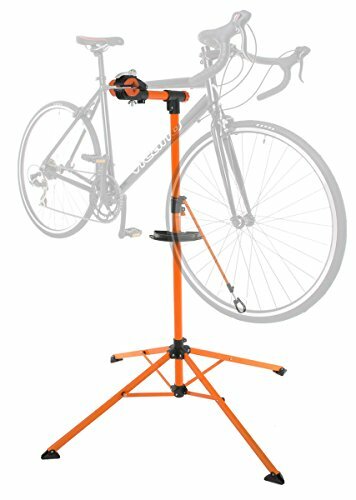 The Feedback Sports mechanic bike work stand measures 5.3” x 8” x 46.3”, and it features a spinner-knob clamp to hold the bike in position, adjustable height from 42” to 65”, and a weight of 12.6 lb. Another great thing about this stand is that has a clutch for 360-degree rotation so that you don’t need to readjust the clamp. 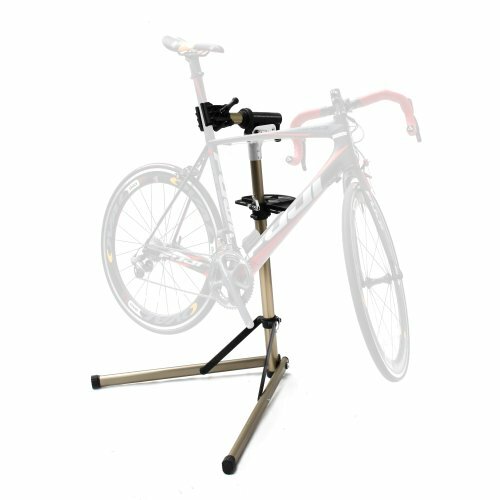 The stand supports bikes up to 65 lb. In general, users have a very high opinion of the Feedback Sports bike stand, and they praise its design, stability, and functionality. A reviewer comments that he was very surprised by the quality of this bicycle rack for repairs and that it set-ups quickly. He adds that the stand folds up to a compact size and that it doesn’t take much space in his garage. Another reviewer mentions that he doesn’t have issues with the clamp mechanism and that it holds the bike in a comfortable working position. 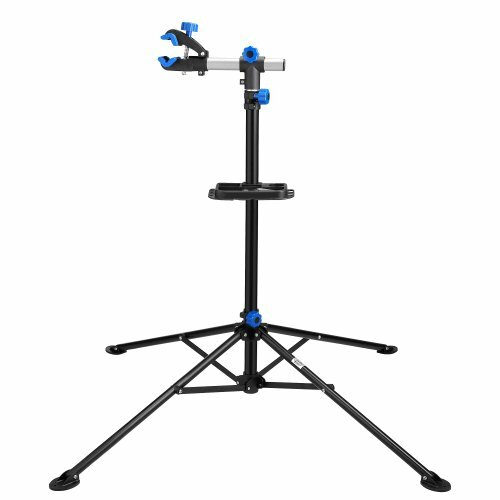 A user also states that bike stand swivels smoothly and that tripod base is more stable than other two-legged models. However, some customers have said that the clamp is not strong enough to hold heavier bikes and that there is no tool tray.